My nephew Josiah is just the coolest kid because he has the most amazing imagination. When he was like three or four years old, I really wanted to create a podcast where it would be just me and him talking about stuff. At the time, you could bring up any topic and he would have an opinion about it—despite knowing nothing about it. His imagination would just run wild. One day the idea came to me—I would ask Josiah to draw a treasure map on a square piece of canvas fabric, and in the weeks that followed, I would embroider over the lines, making his map a permanent, one-of-kind piece. After he finished drawing, I had him identify everything, which turned out to be the cutest part of the whole thing. When I started this project, I thought the embroidery aspect would only take me a few weeks. Well, despite my best intensions, it ended up taking me several months. One thing I decided early on is I wouldn’t care about being consistent with the embroidery floss. I easily could have stock piled the same color of blue embroidery floss to use throughout the project, but I decided I didn’t want to buy anything for this. Instead, I just used the collection of thread I already had. I think this choice added to the overall adorableness of the map. I also didn’t fret too much about my stitching. For the most part, I kept the stitches short, and I didn’t worry about completely covering all of Josiah’s drawing. I was okay if a few ink marks peeked through. To finish it, I cut a piece of blue fabric as the back piece, and I used the quilting technique of binding to create a solid edge. While I created this piece for Josiah to play with—thinking he would roll it up, carry it around and use it in his pretend play—I also think it would be an adorable idea to frame the piece and use it as decoration in your house. Let’s talk about how cute this is for a second. One of my favorite memories from my childhood was going to the Fernbank Museum in Atlanta. My mom must have loved that place because it seemed like we went all the time (to my joy). Though the dinosaur in the lobby was cool, I adored this children’s exhibit dedicated to nature (I mean, it had a tree right in the middle of the room!) And though my memories are vague in the details, I distinctly remember “fishing” in the room’s pretend pond. I could have played there all day, everyday. This memory came to mind when I was trying to come up with a gift for my 3-year-old nephew, and it couldn’t be more perfect. He loved fishing when he was at my parents’ house earlier this year, and I can see it providing hours of endless playtime. 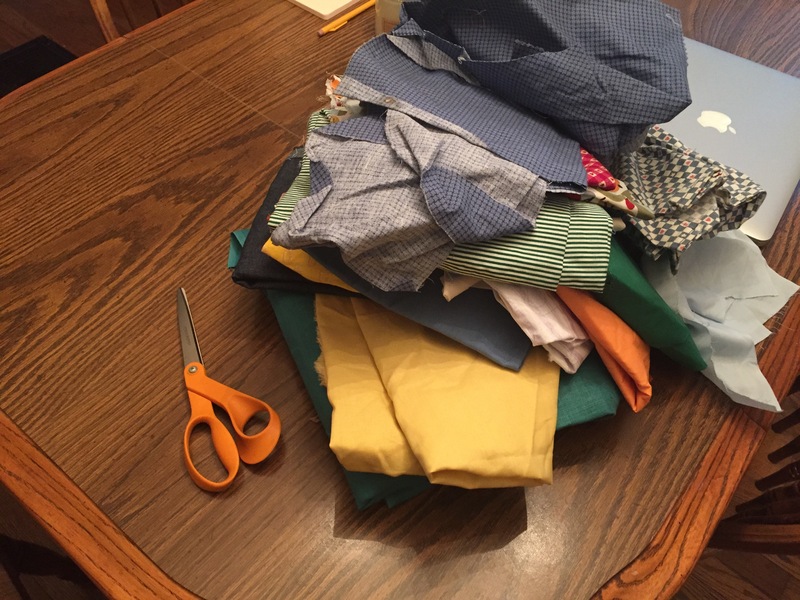 Another pro: I can use scrap fabric. I made my own template by free-handing the fish shape on card stock and cutting it out. I didn’t take the time to make sure the template was perfectly symmetrical, but it all worked out in the end. 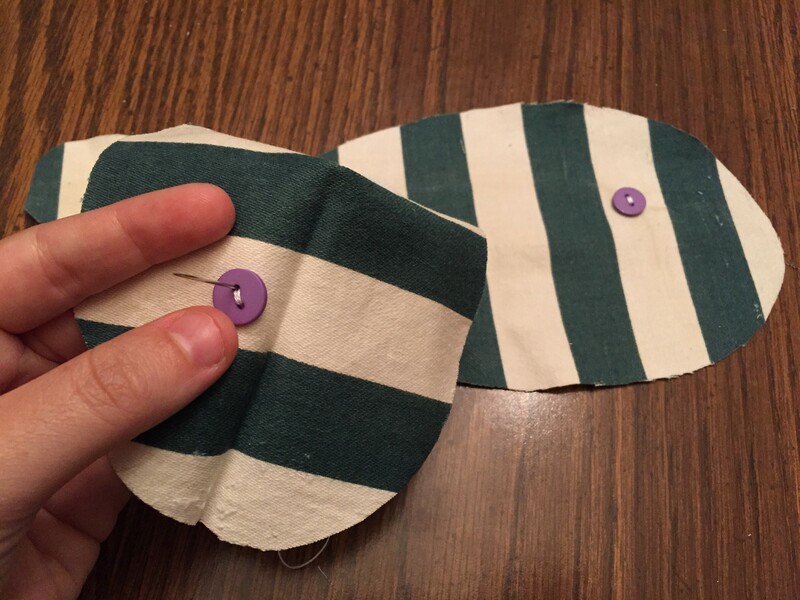 After using the template to cut out the fabric, I sewed on two eyes, one on each piece. 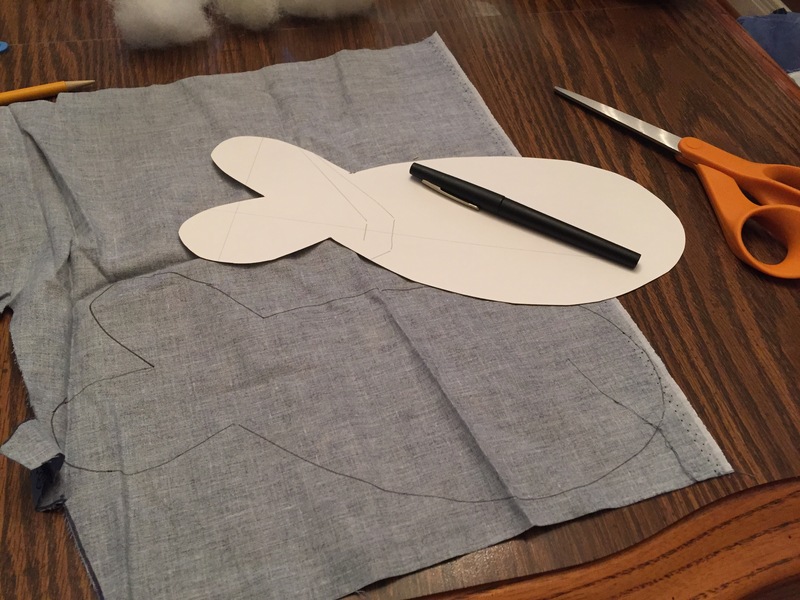 Then keeping right sides together, I sewed the two pieces of fabric together with a 1/4-inch seam allowance, stopping short to leave a hole for stuffing. 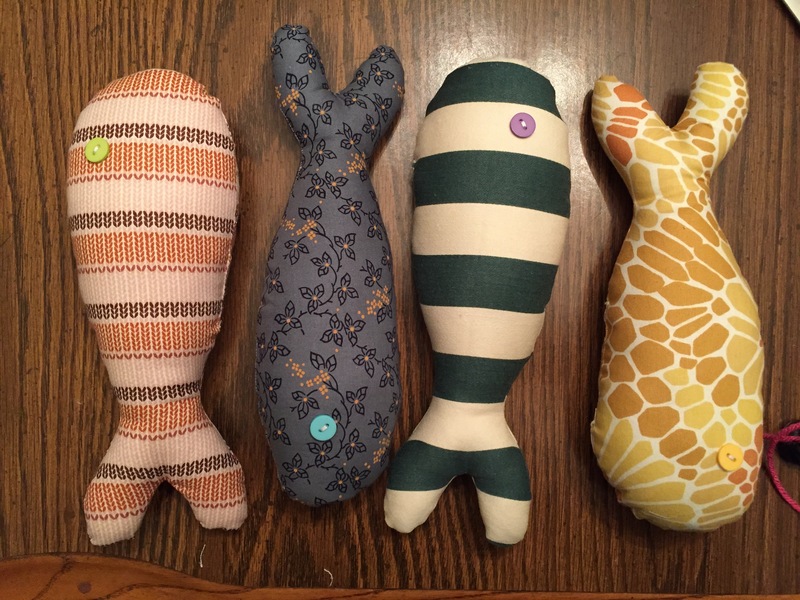 Once complete, I flipped the fabric right-sides out, and used polyfil to stuff the fish. Now the keys to “fishing” are the magnets. I found mine at Hobby Lobby, including these magnet hooks. 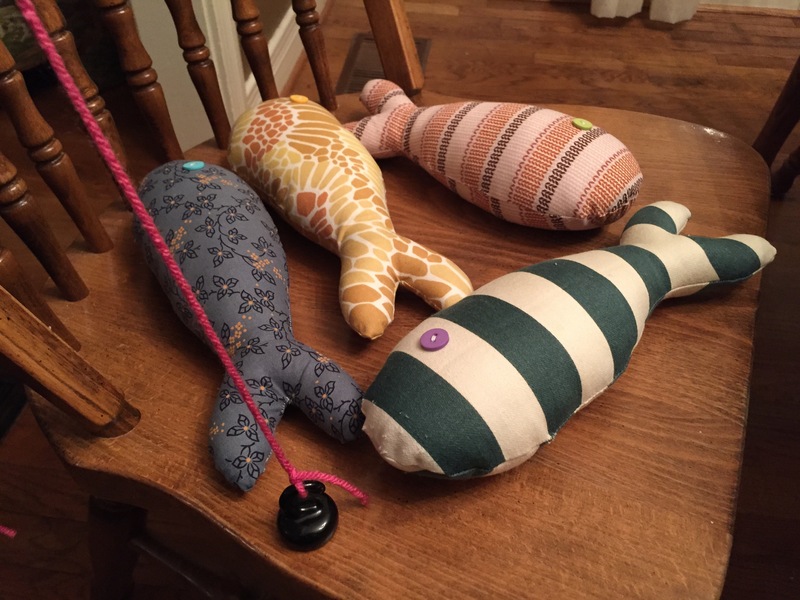 I added a little stuffing to the fish’s “nose” before adding the round magnet. 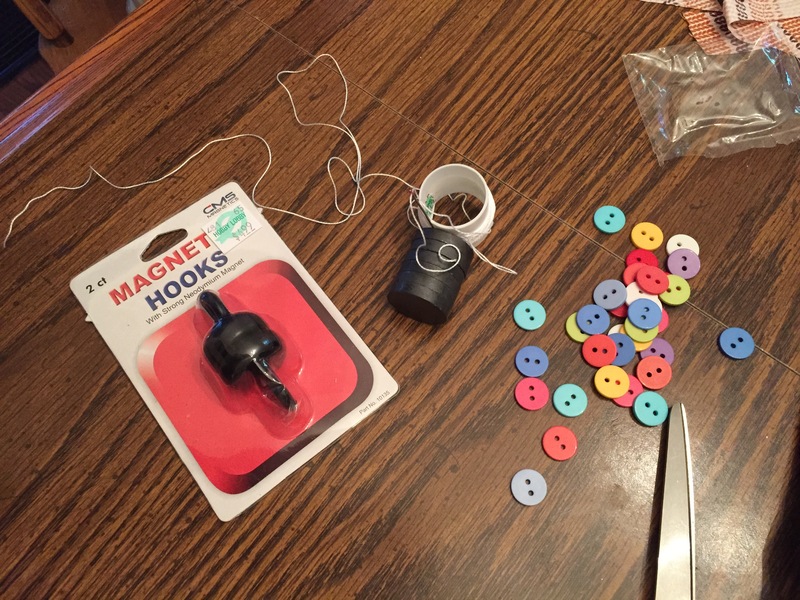 Using the hook magnet, I made sure the right side was facing out for the two to attract. (If the magnets repel each other, just flip the round magnet to the other side. 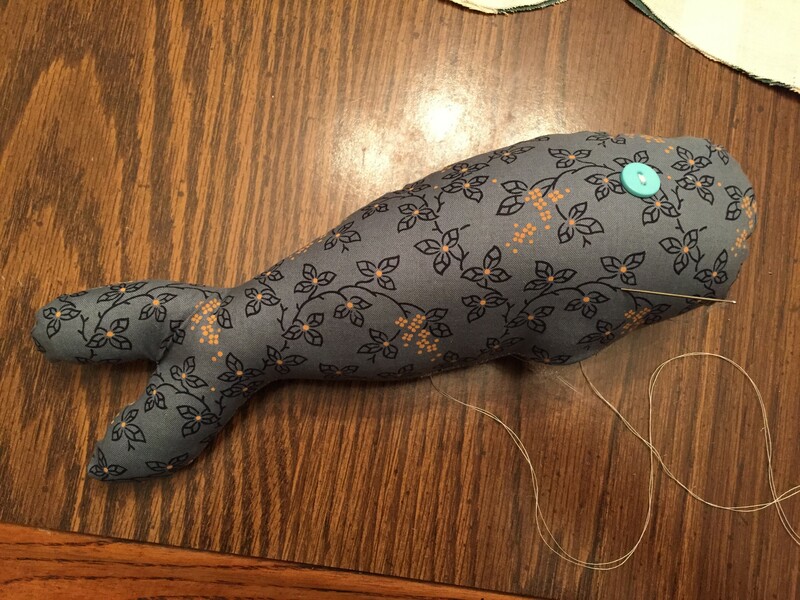 With the magnet in place, I finished stuffing the fish and used a whipstitch to close the hole. I then repeated this process with three more fish. I didn’t create a fishing pole. My mom is actually delivering this gift for me, and I knew a pole would not fit in her suitcase. But I found this cool idea online. But let’s face, poles can turn into swords, and all you really need is a piece of string.